Dual MBAs or concurrent degrees provide students the opportunity to earn an MBA—and the strong foundation of business knowledge that comes with it—while earning an additional degree. With the chance to pair MBAs with a wide range of degree programs from law to healthcare, dual degrees can save students time, money and give graduates the industry-tailored knowledge which will give them a competitive edge in the job market. At the Foster School of Business at the University of Washington, students have the opportunity to pursue a number of concurrent degree programs, allowing them to pursue multiple areas of academic study and demonstrate a strong level of commitment to future employers. 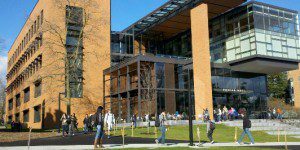 The Foster School of Business and the University of Washington School of Law offers a joint JD/MBA degree program. The joint degree is an accelerated program which typically takes four years to complete, with students beginning their MBA core courses in the first year and moving on to the JD curriculum in the following year. Every student in the program will also receive a faculty mentor. Upon graduation from the joint JD/MBA program, students will be prepared for careers in the many fields where business and law intersect, such as tax law, international business, and much more. Students that are already enrolled in the Foster MBA program may apply to the JD program to be considered for a joint MBA, while students who are not yet enrolled at Foster must first apply separately and be admitted to both programs to be eligible. The MHA program at at the University of Washington prepares students for a variety of careers in the healthcare field. The program employs a rigorous curriculum based on the leadership competency model developed by the National Center for Healthcare Leadership. Students in the MHA program will develop leadership skills particular to their field as well as earning a solid foundation in a range of healthcare topics, from health law and economics to strategic management. The MHA program also gives students the opportunity to pursue a concurrent degree, which includes an MBA/MHA. With such an expansive education in both healthcare administration and business, graduates will be well prepared for high-level management jobs in the healthcare field. Students at the University of Washington may choose to pair their MBA with the school’s Master of Professional Accounting (MPAcc) degree which prepares “accounting professionals with quality education, strong ethics, innovative thinking, and excellent oral and written communication skills.” Students in the program will be well prepared for careers in accounting after graduation, as well as fulfilling the necessary requirements to sit for the CPA exam. By pairing this program with an MBA degree, students will also gain a strong business background and earn the necessary skills for moving into higher-level management and leadership roles.